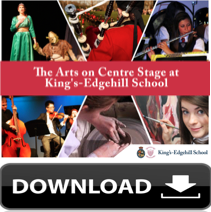 King's-Edgehill School | A Quintuple Threat! Grade 11 day student Katie Goddard of Wolfville sees life as having limitless boundaries. She is a full IB Diploma candidate with an outstanding academic average, a competitive varsity multi-sport athlete and defending alpine ski Provincial Champion, a first-class thespian, a swift dancer and choreographer, and last but certainly not least, a talented musician. Recently, Katie performed for an adjudication jury to get feedback in preparation for her upcoming spring recital. She really likes Eva Cassidy's rendition of Sting's famous song, Fields of Gold, so she elected to sing that in a similar style. This young lady has a wonderfully rich timbre, well-slotted intonation, and super musicality. How one person so young can be so accomplished at everything blows me away! Accompanying Katie in this clip is our incredible piano teacher of thirteen years, Mrs. Nicole Barrett, who we are so very fortunate to have on our instructional team in the Music Department. These two ladies complement each other in this performance -- Enjoy.